Bernard Bailyn gives us a compelling, fresh account of the first great transit of people from Britain, Europe, and Africa to British North America, their involvements with each other, and their struggles with the indigenous peoples of the eastern seaboard. The immigrants were a mixed multitude. They came from England, the Netherlands, the German and Italian states, France, Africa, Sweden, and Finland, and they moved to the western hemisphere for different reasons, from different social backgrounds and cultures. They represented a spectrum of religious attachments. 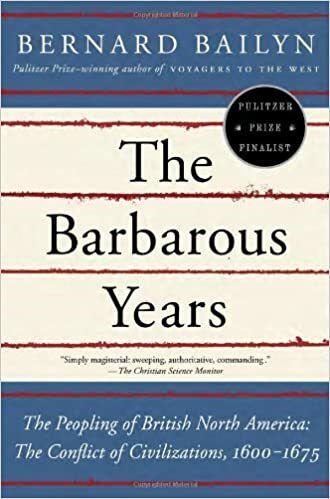 In the early years, their stories are not mainly of triumph but of confusion, failure, violence, and the loss of civility as they sought to normalize situations and recapture lost worlds. It was a thoroughly brutal encounter—not only between the Europeans and native peoples and between Europeans and Africans, but among Europeans themselves, as they sought to control and prosper in the new configurations of life that were emerging around them. Unmasked, 102; and John Childe, New-Englands Jonas Cast up at London… (London, 1647), 21, 24, as reprinted in Peter Force, ed., Tracts and Other Papers Relating Principally to … the Colonies in North America… (Washington, D.C., 1836–46), IV; Kittredge, “Child,” 49. For Vassall’s role in the Remonstrance, see Wall, Crucial Decade, chap. 5. On Winthrop’s view of Vassall: Winthrop, Journal, 624. 55. Newell, “Child,” 227, 254. 56. For Child’s later career, see [Turnbull], “Child,” 20–53. 57.